Thousands of people are injured or die in roof crush accidents due to vehicle rollovers. Victims of such accidents can find their lives in total disarray. Lost wages, medical bills, car repairs and suffering during the rehabilitation process can be physically, financially and emotionally draining. 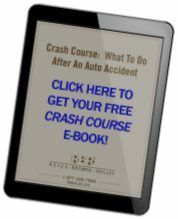 Accident Survival e-Book from Dallas Attorneys Reyes Browne Reilley Law Firm Far too often, rollover accidents are the result of mechanical failures such as tire-tread defects or poor stability design. In such cases, victims of rollover accidents often find themselves fighting auto manufacturers and their entire team of attorneys. Victims who try to handle their cases alone may face lengthy delays, confusing paperwork and procedures, and unfulfilled obligations. Even if a wreck is simply a matter of careless driving, the insurance company of the driver at fault may be responsible for the victim’s medical bills, lost wages, car rentals, pain and suffering. It’s imperative that victims of roof crush accidents know their rights and receive proper handling in dealing with the insurance company. If you or someone you care about has been in a rollover or roof crush accident, please call us at (214) 526-7900 or fill out our Case Review Contact Form to the right on this page to find out what your case is worth.